Found at the Arboretum: a tiny, exquisite, pink female cone of a 116-year-old Siberian larch (Larix siberica). These and other stunning ephemera are found at Arboretum director Ned Friedman’s Facebook page. On a glorious spring afternoon in April, when the sky was a continuous, deep blue, Arnold Arboretum director Ned Friedman set out on a quest on its grounds. 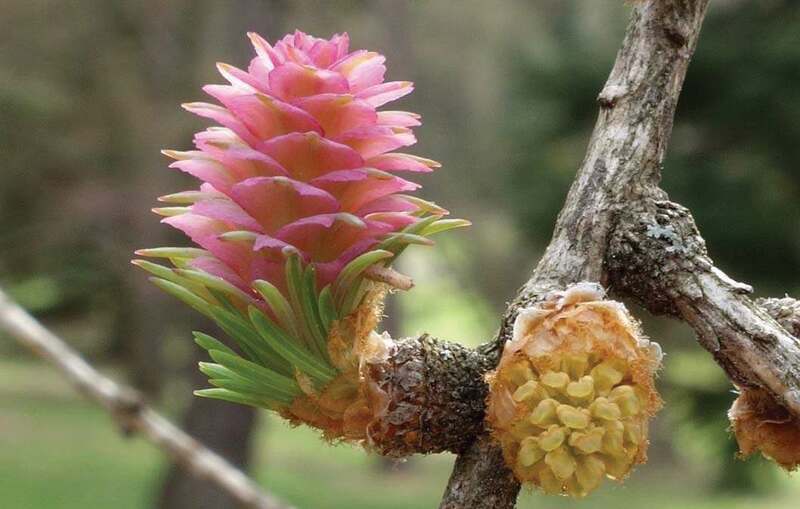 He was seeking the perfect young female seed cones—red, brown, purple, or pink—of Larix siberica, the Siberian larch. He paused periodically, stopping to admire the beautiful exfoliating bark of Acer griseum, explaining that it is photosynthetic, like a leaf. This species is represented in the West by offspring of just two specimens brought back by the arboretum’s great plant collector E.H. Wilson in 1901 and 1907. A recent expedition to sample the rare maple’s genetic diversity from nine populations in China revealed a species under duress: only one population had produced seeds, and only a few. At one rocky site at the base of the conifer collection, Friedman noted that horticulturists will attempt to grow Ephedra, the Mormon tea plant; it normally lives in deserts. Once thought to be a close relative of flowering plants, molecular work shows that it is instead most closely related to conifers—hence the siting within the arboretum collections. Along the way, Friedman greeted visitors; he chatted with a local bike-shop owner who had a suggestion relating to a new bike path that will take commuters off city streets and through the grounds instead. Below a hill offering a long view up into the conifer collection, Friedman stopped again. At center stood a magnificent Metasequoia glyptostroboides, the dawn redwood—the first specimen to be grown outside of China, he said (the species was discovered in 1941, and and was formally described by a Chinese botanist who had trained at the arboretum)—and one of the most beautiful conifers. Each week, Friedman photographs one of these “myriad ephemera” at the arboretum, and captions the image with scientific or cultural context in an e-mail to plant lovers around the world that is also posted to Facebook. It’s part of his public outreach, complementing the arboretum’s events and classes in a multi-pronged mission: serving the public, as well as meeting scientific priorities and conservation goals—an effort to connect people to plants and diversity. The arboretum, with its Frederick Law Olmsted-designed paths, roadways and vistas, incorporation into Boston’s “emerald necklace” of parklands (Harvard donated the land to the City of Boston but retained a thousand-year lease), and free admission (unique among major arboreta), has had this important public role from the outset.